I love the virtual change of seasons inworld having only 2 seasons where I live – Tourist Season and Rainy Season (aka Hurricane Season). 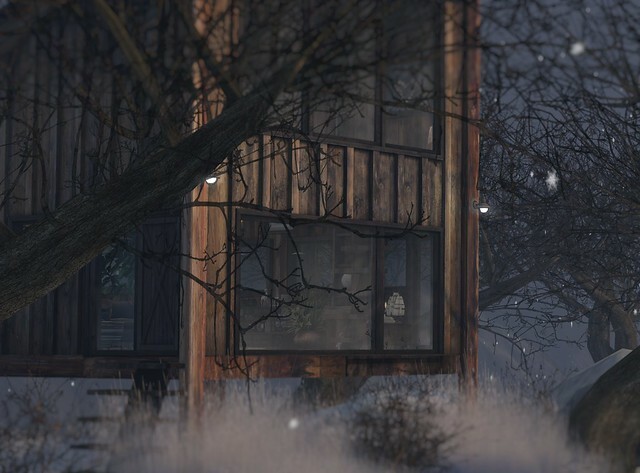 I’ve been so busy with real life, depression, and work that I practically missed autumn inworld. I was able to get a bit of a fix at Aspen Fell. Aspen Fell ~ Memories is a pretty sim featuring a railway with train, water tower, floating bridges, and other charming vignettes for hanging out, photography, and exploring. The lovely thing about it is, there’s a stream running through dividing the sims into two. The cusp of winter is on one side, with the last bits of fall clinging to it, the other side is a winter setting. If you are looking for a pretty little place for a date, to sit and chat, meet up with friends, or for photography purposes, it’s worth stopping by. LeLutka released several new heads today. To read the full release notes, visit LeLutka‘s update post. I’m wearing Spencer in this post, along with YS&YS’s latest skin for LeLutka heads – Emilia. Spencer is really unique when you take a look at it. I found the eyes were particularly striking. The cheeks are nice to work with on the sliders as is the chin. I really think this will be a great head to really play with eye makeup with. I’ve styled it with Mina’s new hair Molly, which is currently available at Uber. Head: LeLutka – Spencer NEW! LeLutka is set to release several new heads this week. Here is a sneak peek of May. They are all bento, and with this release also comes an update to past bento heads Simone, Chloe, and Cate with new facial animations. They range from a variety of moods you can cycle through, and even have more than one selected, as well as mouth poses and animations. Also new, and what I really like, is the ability to toggle off one ear, rather than both ears to accommodate even more variety of different hairstyles. To read the full release notes, visit LeLutka‘s update post. I’m wearing May with YS&YS’s Olga appliers. I really like how cute baby face May can run, and played around with a variety of skins, but settled on Olga for her. I’ve decided my May/Olga combo make her look of Ukrainian descent. Yes, when I dress my avatar I reinvent her each time with a whole history and lifestyle. Virtual barbies ya know? I’ve styled them with some recent releases from Exile and Ison that until tomorrow – August 8th, are available at Collabor88, thereafter at their main stores. Head: LeLutka – May NEW! The last day of Hair Fair is traditionally known as Bandana Day. In support of those suffering from a variety of diseases causing their hair loss we remove our hair this day, and instead wear a bandana. Each sim also contains Bandana Booths featuring bandanas made by residents of Second Life. Bandanas are limited edition, $50L each, with 100% of price going to Wigs for Kids. Also available this year are Hare’s made by Anya Ohmai, wearables featuring a bandana. For more details about Hair Fair 2017 visit the blog. Also check out the Flickr groups – Hair Fair 2017 Official Flickr Group, and Vendor Images. Wigs for Kids, is a non profit charity that provides a complete hair system for children suffering from hair loss due to illness, or injury. For more information visit Wigs for Kids. Vanity Hair released 3 hairstyles at Hair Fair 2017. Queen Rhi is a fun hair style that includes a headphone crown (not shown)/. The style is a short hair pushed behind the ears, with volume. Chocolate & Chill is a full curly short mop of a hair style. Lots of curl, and volume. Montenegro are dreads that are half up, half down with serious volume and height. Hair bases are included with all styles. Vanity Hair is located here on the Blonde sim. Hair Fair 2017 runs through July 16th. Featuring hair creators of Second Life, each hair sold donates a percentage to Wigs For Kids. Each sim also contains Bandana Booths featuring bandanas made by residents of Second Life. Bandana’s are limited edition, $50L each, with 100% of price going to Wigs for Kids. Also available this year are Hare’s made by Anya Ohmai, wearables featuring a bandana. Mina released 3 hairstyles at Hair Fair 2017. Fiona is a messy pigtail braided style. Luna is a half up, half down, pigtail bun hair style. Emma is a long hair, with hair to the front and back, parted on one side. Mina is located here on the Redhead sim.